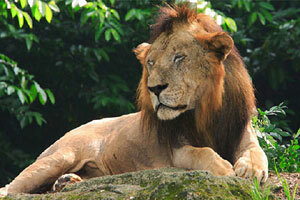 The Singapore zoo is formerly known as the â€œSingapore Zoological Gardensâ€. In 1973 it was inaugurated with a collection of about 300 animals from 70 species. 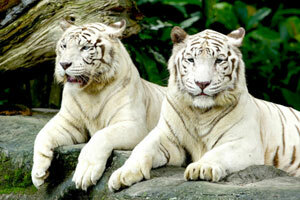 The specific features of the zoo are it is situated on the cape of the Seletar Reservoir. Here the zoo exposes to an â€œOpen conceptâ€ in which the animals are housed in open places landscaped to resemble their natural environment. It has become the home to about 2800 species out of which 26% are dangerous. Singapore zoo has been the best tourism spot in the world. Deputy Prime Minister and Minister for Defence Goh Keng Swee officially opened the zoo on 27th June 1973. During 1974 a hippo known as â€˜Congoâ€™ escaped and evaded capture in the Upper Seletar Reservoir for 47 days. The zoo sprawls on 70 acres of land. It composes advanced designs. Being an open zoo, instead of cages, animals play in the open landscape as their habitat. However, barriers such as moats and walls are there. They preserve the visitors from such dangerous animals. 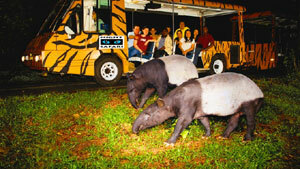 Jurong Bird Park and Nigh Safari management integrated with Singapore zoo under Wildlife Reserves Singapore in the year 2000. 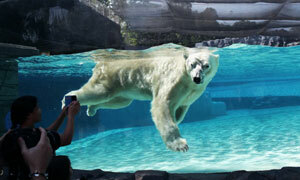 In addition to normal feed to such marine mammals with an icy habitat, the zoo releases live fish for the bears to chase like they would be in a wildlife. Tourists can view the underwater gallery. They enjoy seeing how it is graceful to watch the white hairy beauties can be. Elephants tend to have more affectionate interaction with their keepers. The tourists can see the elephants working on its places. This shows how the giant mammals do have cooperation with their mahouts. The reptile garden consists all cold-blooded animals. The tourists can see even dangerous komodo dragons, marmosets, iguanas, and tortoises. The Caribbean manatees, Californian sealion, jackass penguin, pelicans star are present in the show. These creatures not only entertain the picnic people, but also educate them about the wildlife conservation. They expose the dangers of marine animals to the people around the world. In this tourism spot, you can enjoy seeing the worldâ€™s smallest to largest bats. The Malayan flying fox is one of the largest bats in the world. It has a wingspan of up to 1.7 m. This tiny dog-faced fruit bat weighs around 30-100 grams. The bat show is present along with Mangrove walk. This open night zoo concept exposes many nocturnal animals. More than 900 nocturnal animals in their natural environment. It has been the popular touristsâ€™ attraction in Singapore zoo. This worldâ€™s first night zoo was opened in 1994. It makes the visitors see more than 2500 nocturnal animals from 130 varieties of species after the dusk. It will definitely be a goose-bumping experience to all visitors. The night safari attracts more than one million people per year. All show interest to have a night rides in the jungle. The 50 minutes tram ride takes you to a different world. Wild Animal Carousel, Megabounce, Animal Friends Show, Rainforest Fights Back Show, Rainforest KidzWorld Wet Play area, Treetops Trail, Primate Kingdom, Gibbon Island, Free-Ranging Orangutans are the other sightseeing places in Singapore zoo. Singapore always remains hot and humid around the year. Feb-April: The months fall between summer and winter. Tourists can enjoy with plenty of outdoor activities . May â€“ June: These are the hottest months. Probably most of the Asian people will visit here during the time. This time is expected with full of crowd. July-September: July is the season for Great Singapore Sale and Singapore food festival. So when the tourists visit during the month, they can enjoy every facet of the Singapore. November-January: These are the wettest months and showers will be heavy. This tourism spot encompasses best hotels, restaurants, spas, resorts, star hotels, and lodges for accommodation. However, you should enjoy the jungle breakfast with Orangutan. The award-winning breakfast program in â€œAh Meng Restaurantâ€ with sumptuous food items is really awesome. Donâ€™t forget this picnic spot to enlist in your itinerary.